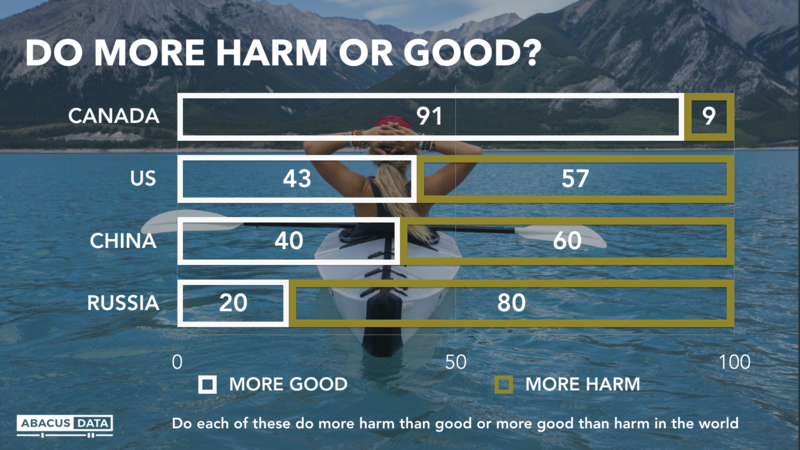 We asked people whether they thought Canada and several other countries were doing more good for the world or more harm. Canadians are almost unanimously that our country does more good than harm in the world. The majority feel the US does more harm; results are almost identical for China. A broad 80% see Russia as an unhelpful force in the world today. While issues, generations, gender, regional tensions and political philosophies can lead to disagreements within Canada, on this simple test – do we as a country do more good than harm – there was plenty of pride on display. 90% of each age group say we are a force for good. Men and women are only 3 points different. And more than 85% in every region feel this way. Bruce Anderson: “On Canada Day, it’s worth taking note that despite all the things that can set people apart, and the days and ways that we can be disappointed in our country, we almost all seem to believe that on balance, Canada is bringing something good to the world. Our survey was conducted online with 1,200 Canadians aged 18 and over from May 24 to 28, 2018. A random sample of panelists was invited to complete the survey from randomly selected Canadian adults who are members of the Maru Voice Canada online panel. The Marketing Research and Intelligence Association policy limits statements about margins of sampling error for most online surveys. The margin of error for a comparable probability-based random sample of the same size is +/- 2.9%, 19 times out of 20. The data were weighted according to census data to ensure that the sample matched Canada’s population according to age, gender, educational attainment, and region. Totals may not add up to 100 due to rounding. We offer global research capacity with a strong focus on customer service, attention to detail and value-added insight. Our team combines the experience of our Chairman Bruce Anderson, one of Canada’s leading research executives for two decades, with the energy, creativity and research expertise of CEO David Coletto, PhD.